It's been just over a year since Nikon announced the D600. The company's compact full-frame camera delivered a ton of power for $2,100, and it's still a top option for photographers looking for a new DSLR. Still, for one reason or another, Nikon's figured it's time to refresh its high-end body, with the nearly identical D610. There's still a 24.3-megapixel FX sensor, an EXPEED 3 processor, a 25,600 top ISO, dual SD card slot, 39-point autofocus and a 921k-dot 3.2-inch LCD. The improvements, while relatively minor for most users, may be fairly significant for certain professionals. The most appealing addition is a quiet continuous mode. After activating it by selecting Qc on the mode sub dial, you'll be able to shoot at up to 3 fps with limited mechanical noise. Additionally, the traditional continuous mode has been boosted from 5.5 fps to 6. There are minor white balance improvements with the D610, too, enabling improved skin tone reproduction when shooting in artificial light. Inside and out, the Nikon D610 is dynamically engineered to deliver the outstanding balance of image quality, performance and operability that only a full-frame camera can offer. The large 24.3-megapixel FX-format (35.9 x 24mm) CMOS sensor is capable of creating low-noise images with amazing dynamic range, clarity and precise color, even in challenging light. No matter the type of photography, from landscapes to wildlife, portraits to sports, the Nikon D610 excels, delivering stellar sharpness, superior handling, and the ability to enjoy the full resolution benefits of a wide variety of NIKKOR glass. Image quality and performance are further bolstered with the aid of Nikon's EXPEED 3 image processing engine, which helps to provide vivid colors and an exceptionally broad tonal range while quickly processing image data transfer from capture to card. Additionally, EXPEED 3 contributes to surprising energy efficiency for all-day shooting. 39-Point AF System and Scene Recognition System: Users can select single point, continuous, dynamic or 3D autofocus modes to adapt to any shooting situation from static subjects to dynamic athletics. The Nikon D610's 39-point AF system quickly acquires focus throughout the frame, even on fast moving subjects. For further accuracy, the system uses Nikon's exclusive 3D Color Matrix Metering II 2016 pixel RGB Sensor in conjunction with the Scene Recognition System to analyze the scene and adjust exposure, white balance and focus. The resulting images display a more balanced exposure, precise sharpness and accurate color. Furthermore, the D610 utilizes nine cross-type sensors, seven of which retain AF ability up to f/8, a true boon to wildlife and sports photographers who rely on teleconverters for maximum distance. Unleash Creativity with Advanced Modes: With a wide variety of creative modes designed for enthusiasts, users can continue to express themselves in new, creative ways. A series of images with multiple exposures can be combined with built-in HDR, while users can explore their inner artist with an automatic Time Lapse Mode, or the intervalometer found in all advanced Nikon D-SLR's. To adjust color, saturation and other image parameters on the fly, Picture Controls can be applied to both stills and HD video. The Nikon D610 is compatible with a wide variety of NIKKOR Lenses, allowing users to truly realize a lens' potential with an FX-format camera. For eighty years, photographers have come to rely on Nikon's heritage of optical excellence for lenses that deliver the pinnacle of optical quality. Additionally, the Nikon D610 is fully compatible with Nikon's Creative Lighting (CLS) System, and can act as a Commander to control up to two groups of Speedlights, in-camera. Nikon, At the Heart of the Image™. Nikon Inc. is the world leader in digital imaging, precision optics and photo imaging technology and is globally recognized for setting new standards in product design and performance for its award-winning consumer and professional photographic equipment. Nikon Inc. distributes consumer and professional digital SLR cameras, NIKKOR optics, Speedlights and system accessories; Nikon COOLPIX® compact digital cameras; 35mm film SLR cameras; Nikon software products and Nikon sports and recreational optics as well as the Nikon 1 advanced camera with interchangeable lens system. Nikon Corporation, the parent company of the Nikon Inc., recently celebrated its 80th anniversary of NIKKOR optics, and announced the production of over 80 million NIKKOR lenses in 2013, creating a new milestone in Nikon's heritage of superior optics. 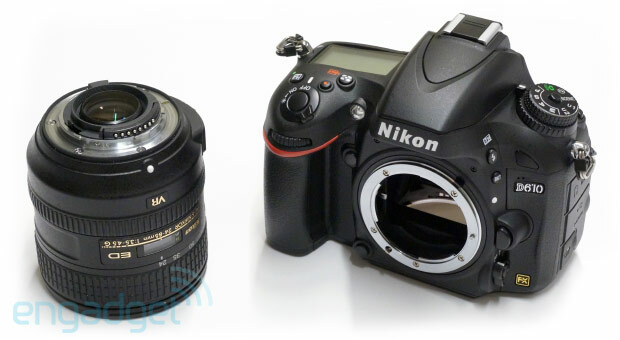 For more information, dial (800) NIKON-US or visit HYPERLINK "http://www.nikonusa.com" http://www.nikonusa.com, which links all levels of photographers to the Web's most comprehensive photo learning and sharing communities. Connect with Nikon and other photographers on Facebook at HYPERLINK "http://www.facebook.com/nikon" http://www.facebook.com/nikon and get the latest news and information from Twitter by following HYPERLINK "http://www.twitter.com/Nikon_USA" @NikonUSA. 1The Wireless Mobile Adapter Utility Application must be installed on the smart device before it can be used with the WU-1b Wireless Mobile Adapter connected to the Nikon D610. The application can be downloaded free of charge from Google Play™ or the Apple App Store. For use with Android or iOS mobile devices, please refer to mobile device compatibility and available features at HYPERLINK "https://play.google.com/store/apps/details?id=com.nikon.wu.wmau&hl=en"https://play.google.com/store/apps/details?id=com.nikon.wu.wmau&hl=en (Android) or HYPERLINK "https://itunes.apple.com/en/app/wireless-mobile-adapter-utility/id554157010"https://itunes.apple.com/en/app/wireless-mobile-adapter-utility/id554157010 (iOS). 2Android and Google Play are trademarks of Google, Inc. 3iPhone, iPad and iTunes are trademarks of Apple Inc., registered in the U.S. and other countries. 0 Response to "Nikon's full-frame D610 DSLR is a minor step up from the D600, we go hands-on"